At only 329 calories per serving, it makes for a light but satisfying weeknight dinner. Do you love pasta but hate the carbs? Here's good news: There's no need to completely eliminate pasta from your diet, even if you're looking to drop five pounds. Eating too much will make you feel sluggish, but if you limit yourself to smaller portions, the carbohydrates in pasta will power you up, boosting your energy throughout the day. To help slow down the digestion of carbs and sustain your energy reserves, try adding fat and protein to your meal. 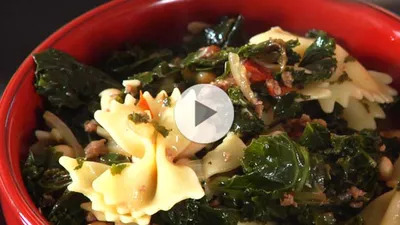 One great option is this recipe for Farfalle with Sausage, Cannellini Beans, and Kale. It has Italian turkey sausage, which adds flavor, heat, and a heaping dose of protein; cannellini beans, which are high in protein and fiber and low in fat; and kale, a superfood filled with vitamins A, C, and K, as well as iron, calcium, and antioxidants. Watch the video to learn how to put together this rustic pasta dish. It's packed with nutrition, and at only 329 calories per serving, it makes for a light but satisfying weeknight dinner.